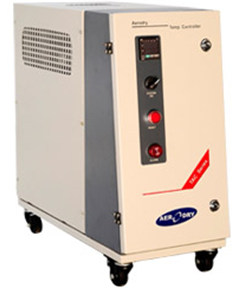 Aerodry TAC Series Mold Temperature Controllers are ideal for heating/cooling with water/thermic oil as fluid medium for maintaining temperature in various applications for plastic moulding & extrusion process with precision temperature control. In-built auto cooling circuit to avoid temperature surge. Audiovisual Alarm in case of faults. SS cartridge filter for cooling & heating circuits. In-built vent with oil/water filling cap. Overload and level protection for pump. Switchable from oil to water mode. Forward Reverse Mold drainage facility. High pressure water based model available upto 120oC.